My first post on B115, “You are here so you might as well try it”, focused on the theme of exploring the world. It spoke about having the courage to engage, to “try” things out: tasting, experiencing, learning. This article will integrate this theme more deeply with B115 through the astrological / colour connection of Gemini and Orange. This article will also introduce some additional significant Gemini associations of this new bottle. The first question has to be though "Why Gemini?" B115 was born just two days before the “supermoon" Full Moon of December 3rd. This Full Moon occupied the space in the sky which lies in front of star constellation of Gemini. Thus it is called the Gemini Full Moon. The fact the moon was closer to the earth than usual at this time (and thus seemed bigger than normal in the sky) is what makes it a supermoon. Esoterically speaking we could say that this larger than normal appearance gives it a greater effect on consciousness. Gemini is of course the constellation of “The Twins”. Therefore before we focus on the Gemini / exploring the world theme more deeply lets first look notice some interesting “twin” themes that have appeared with B115. 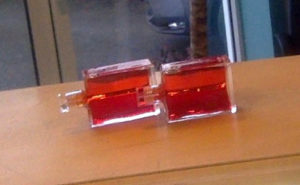 Just the way it happened, here is the picture of my first sighting of the new bottle. When i went to collect my B115 from Aura-Soma Products I was very surprised to see not one but two bottles lying there on the desk. I had only ordered one. I asked Debbie at reception about it and she said she had brought an extra one for the shop. I had to take a photo. It seemed so symbolic of this Gemini quality. Another striking two-ness. B115 is not one Archangel but two! Khemiel and Ariel. For the first time ever, we have a “twin” archangel pairing. I will talk more about their significance later, but first, lets simply notice this coincidence. There is a further two-ness coincidence in the Archangelic aspect of B115. Just over 24 hours after B115 was born an image of these archangels appeared on Facebook from Pamela Matthews. She is the painter of the Aura-Soma New Aeon Tarot images. How could she have painted this finely detailed image so quickly? Well it turned out that, very surprisingly, she had received a special commission to paint Khemiel and Ariel from a client some years previously. 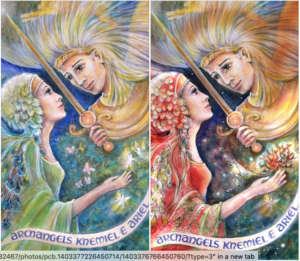 With this picture already created she only needed to make a few small changes such as the dress colour of Khemiel before releasing the image online. It gives the idea that there was one version already "in" our world and that now a second version, its "brother" as it were, has arrived from another world to stand beside it. This "here and elsewhere" idea, which could alternatively be described as “half in / half out” has a strong resonance with the story of Castor and Pollux. These are the “Twins” of Gemini. Two brothers, one Castor, was fully human and would therefore die, while the other, his brother Pollux, was divine and therefore immortal, meaning he could not die. The story is that when Castor was wounded and lay dying, his brother Pollux, pleaded with Zeus- the King of the Gods, to save him. Pollux offered to share his immortality with his dying brother. The arrangement became that the twins would separate and that at any one time one would live in this world / the underworld while the other would live with the gods. From time to time they would have a brief chance to share their experiences as they swapped their positions. And so we see today, not just these two archangels side by side in the bottle name, but also two expressions, of their togetherness. the first picture of the bottles and the two artistic representations of these archangels, also appearing side by side. Double Gemini! It can also be said that since the Teacher Updates of last month a two-ness has been created within the Aura-Soma community. Those who attended are officially part of the new Aura-Soma going forward, and the remainder, those who did not attend, myself included, are, for the moment at least, out. 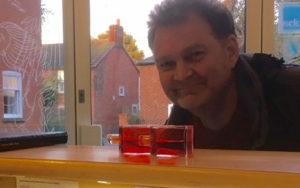 As i knew my first photo of B115 would be of low quality i asked Debbie at reception to take a picture of the bottles using her phone. As she took the photo i ducked down to include myself in the photo. When i received the photo and looked at it i realised it expresses another half in / half out situation. Debbie from the Aura-Soma side of the desk is "in", while I on the street side of the desk, am "out". Having looked at these specific examples of Gemini "two-ness" let's now explore more deeply the connection between the B115, Gemini, and the wish to experience the world. The key lies in the colour orange. It was a German astrologer back in the 1990’s who brought to Dev Aura the inspiration that that the Colour Rose sequence from Red to Magenta could be mapped sequentially on to the sequence of Star signs in the Zodiac. Orange, as the third colour in the sequence (after Red and Coral) thus corresponded to Gemini which is the third sign. With this association in mind we can look at B115 and say Orange / Red represents Gemini (orange) grounded (red) in this world. Lets follow this connection a little further though because, as i said at the start of this post, Gemini very much connects with my first B115 article, namely the theme of being willing to engage with and explore the world. This connection is easier to introduce if I approach it from Vicky Wall’s Bottle / Star Sign associations. Vicky Wall, the founder of Aura-Soma, connected Gemini with B20 - The Star Child bottle. It was an association that was to be very helpful in evolving my way of my own personal presenting of the astrology colour connection in the Level 2 of the Training. Gemini. The baby becomes the child. It is the time to explore, to acquire experience. Curiosity is key, everything is interesting, the soul needs to learn about this world. It is the Star Child, eager for experience, come to learn about being in this life. Here is the connection to my first thought for B115. As B115 was being born in Tetford I was working in a nearby town offering cheese for sale on a market stall. I could see some people were interested but also that they were afraid to approach and taste it … “Why don't you try it?” was my thought. I could have said "Why don't you allow yourself to be as a child, as Gemini, and open to learn about the world?" The message of Star Child is the easy way to understand Gemini's connection to being curious about life, wishing to experience it. But how, now, can we understand this theme's connection to the colour orange? The next step. Shining in Yellow. Following the zodiac story a little further is a good place to begin. After the child-like exploration of Gemini we come to the next sign Cancer with its Moon energy. This is the instinctive habitual layer of our nature, our comfort zone, B13 Clear / Green. It is here that we feel at home. This sign is followed by Leo, the Sun energy. B5. Yellow / Red. In Leo we shine as our exalted self. This self shining will correspond with yellow. It stimulates the consciousness of "Look at me. I am the king." This orange stage which builds up to the emergence of yellow “I am” will be central to the next part of the story. My next article is coming soon. As always you expose your thoughts at various levels of depth and it is very nourishing to receive. a renewed focus on our Hearts. I end up with my wishes to you and your family for a Smiling Christmas and inner preparation for a New brilliant Year ahead! Thank you, dear Dominic. I myself am a Gemini and curiousness is a very present key in my life. I am going to be 70 next year, and my thirst of knowing, learning and discovering the world around me is led and always will be led by sincere and healthy curiosity…My twin is frequently taking the opposite side in this game. Thank you Edith. 70 and still going strong. Well done you! I wish you too a happy 2018. Hello Gabriella. Always nice to hear from you. Yes from I to We sounds good. Though not having attended the Teacher Update i am wondering what my we is. 🙂 In fact i would answer that even now as the we of all who are interested in Aura-Soma as a spiritual gift and a wonder.